So once we had the "design" figured out, it was time to start sculpting. 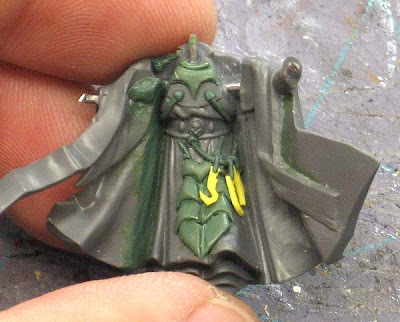 In the process of sculpting, I tried to borrow or keep as many elements as I could from the original model. I figured this would help people "know" what the model was at first glance. I've beaten that horse dead, so here's the link to that discussion and we'll move on. I started with sculpting the elements on his body since those would be near impossible to get to once his arms were added. This wasn't much more than his armour and the trinkets he has on his belt. Each step was started with a sketch or mock-up type image that I showed to my Client to make sure I was sculpting what he wanted to have on there. You can see how we laid out the elements on his belt and the placement of his combat drug tubes before sculpting them in place. Once I had all the "inner" elements in place, I added his arms. I'd already made the necessary adjustments to them prior to pinning them in place. 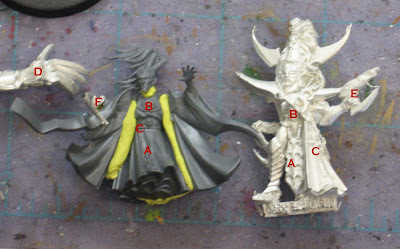 Both arms were repositioned as well. 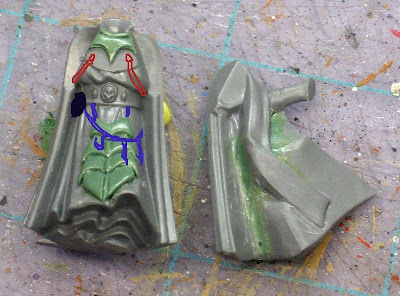 That meant I had to sculpt his cloak to fill the gaps on both sides of his torso. If we hadn't "opened" the pose up, all of the work we did in the beginning would have been for nothing, you wouldn't have been able to see anything. And here he is without his shoulderpads. 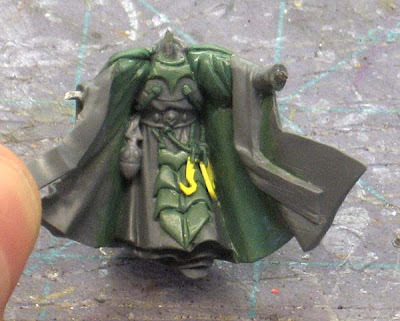 All of the elements are in place, his arms have been pinned on and gaps filled and I even went back in a sculpted his arms the would ultimately end up under his shoulderpads... but I wanted them to be there in case part of them ended up showing from underneath his shoulderpads. I didn't want to have to try and fill in any voids later on. Thanks for the post. I particularly like your very well laid out explanations of the conversion. I really like this. 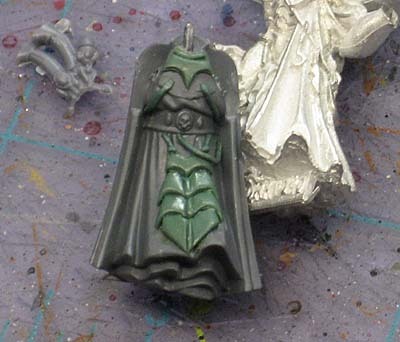 Especially the finer details as that's what I really have trouble with. Great post, Ron. Love the attention to detail and well-thought out approach. I honestly don't know how you manipulate that green stuff so dexterously. Your really talented. My stuff is not so much, cause every time I pull one part it distorts the rest! I agree with Pastafarion, your green stuff-fu is pretty awesome! I went Dave Taylor's green stuff class at War Games Con and I felt as if I learned some stuff, but wow, your stuff is just wow! That really astounding, I hate using dreen stuff and a project like this... well lets just say I would have thrown it by now and pretended I had never started it. really really great stuff. Thanks, it gets better too, I'm working on the next update for this guy... I should have it up later this week.